This gorgeous bracelet mixes semi-precious beads with bead caps for a wonderful effect. Using a headpin, pick up x1 tiger eye bead and x1 bead cap. Trim the headpin leaving approx. 1cm, then bend the pin to a 90 degree angle, as close to the bead as possible. Using a pair of round nose pliers, turn the end of the pin to form a loop. Repeat this step x3 more times. Repeat step 1, but instead use a Swarovski round bead and a bead cap, repeat this step so you have two headpin Swarovski charms. Create x2 charms by grouping x2 tiger eye and x1 Swarovski beaded headpins together and attaching them to the same jump ring. Cut a piece of elastic approx. 50cm. You can either cut this in half and uses two pieces of elastic, or thread onto a big eye needle and sit the needle at the half way point of the elastic. Using two pieces of elastic adds extra strength and security. x1 tiger eye, x1 Swarovski round, x1 tiger eye, x2 bead caps (facing each other to form a cup), x3 tiger eye. Repeat this x3 more times and add x 2 bead caps so they face each other. 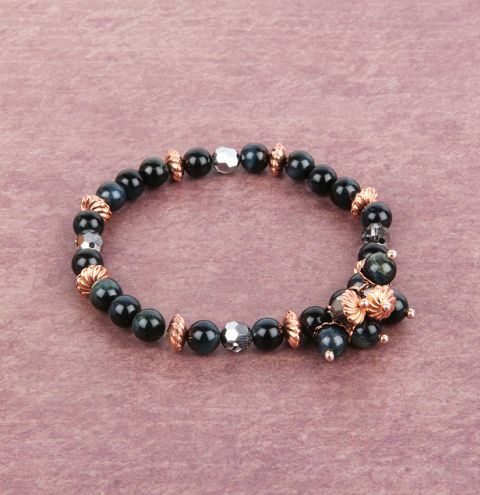 When you are adding the final set of x3 tiger eye beads add the charms you made at the begining in between each bead. Once all the beads are added you can now cut the elstic from your needle (if used). You should have x4 elastic ends. Take a piece of elastic from each end and tie a surgeon knot. Repeat the knot with the remaining two ends. Trim the ends of your thread and hide your knots within the beads. You may wish to use a drop of glue or clear nail varnish to secure your knots.